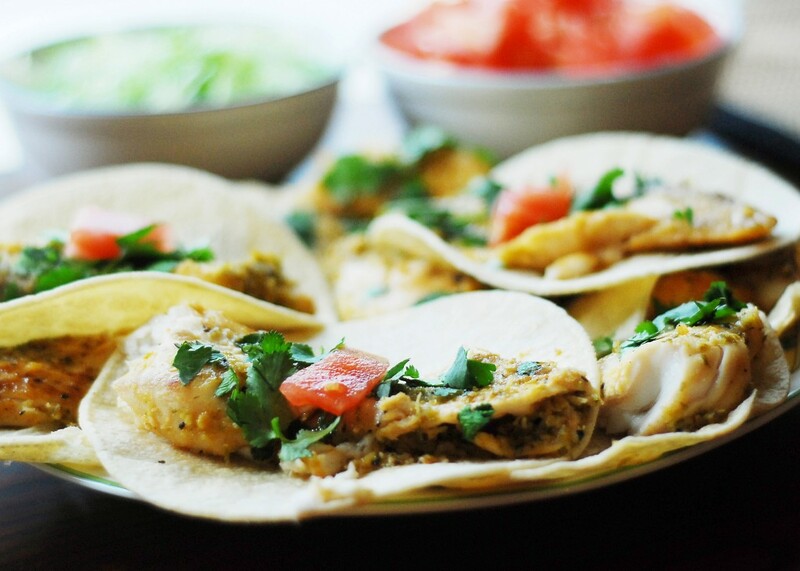 Maybe they were so good because I didn’t have to make them, or maybe they were so good because my father-in-law is a great cook and he brought together some terrific flavors, but either way, these fish tacos were awesome!! A little sweet, a little salty, and very tasty. And from what he said, they were easy to make! Assemble marinade by combining lime juice, olive oil, honey, tabasco, salt, pepper, and garlic in a gallon-sized zip-top bag or shallow container with a lid. Add fish and marinate in the refrigerator anywhere from 30 minutes up to overnight. When ready to cook, combine with a pinch of salt and pepper on a plate. Remove each fish fillet from the marinade and if you want, you can dredge lightly with the coconut flour on both sides. Or, skip this part and just cook directly in the pan. That’s what my father in law did and it turned out really well. Not sure it needs the coconut flour but the kids might enjoy the little bit of crunch it would add. Heat 1-2 tbsp coconut oil (or butter) in a medium skillet over medium-high heat until shimmering. Cook fillets for 3-4 minutes per side or until opaque and browned. Add additional oil to the pan if necessary. While tilapia is cooking, make honey-lime sauce by pouring leftover marinade into a saucepan and bring to a boil over medium heat. Boil 5-6 minutes until slightly reduced. To serve, break fish into large pieces and serve in tortillas or lettuce wraps, add sauce, guacamole and other toppings, and enjoy!